The Volkswagen Passat isn’t just a staple of its segment, it’s also a constant, bona fide leader. With decades of experience to its name, the Passat has remained a top contender for many, many years. Moreover, it shows no signs of aging, as it is constantly adapting to the fast-paced modern-day marketplace of the automotive industry. In the 2020 production year, the VW Passat is adding onto its already-stellar foundation with a generous host of changes, updates, and enhancements to its interior as well as exterior. So, what’s new for the 2020 Volkswagen Passat? As soon as you see the exterior of the 2020 Passat, you’ll probably notice a couple of changes. Among them, one will find a dominant front grille, a dramatic ‘tornado’ line, and a coupe-like roofline. Under the hood, the familiar 2.0-liter TSI® engine now generates up to 207 pound-feet of torque – a drastic improvement over the 2019 model’s output of 184 pound-feet of torque. Inside the 2020 Passat, prospective customers are sure to be enticed by the new glass-covered touchscreen interface, updated instrument panel, and refreshed interior with new colors and premium materials. Suffice it to say, the 2020 Passat has been thoroughly enhanced inside and out. 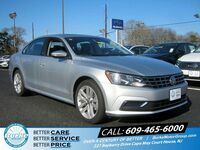 Naturally, the best way to experience it is in person, so who's ready to reserve a 2020 Volkswagen Passat in Cape May County, NJ?